Homeowners who rent out part or all of their home through sites like Airbnb are the target customer base for Slice, an insurance company who provides homeowners per-night insurance for their rentals. Slice is an insurance company who sells homeshare insurance, a type of policy specifically designed for people who rent their home or rooms on a short-term basis, like what you see on Airbnb. The company says the main advantage of their policies is that they’re affordable and they cover various situations related to short-term renting that your homeowner’s insurance may not cover. Slice Insurance was founded in Oct. 2015 in New York. The company’s three founders are Ernest Hursh, Stuart Baserman and Tim Attia. Hursh has an extensive background working with insurance companies. Baserman owned his own management firm for 15 years and Attia also has a background in insurance. Slice’s founders certainly have the qualifications to run an insurance company but the real question is: How does Slice actually work? These are the questions that we’ll cover in this review. We’ll also spend a few minutes talking about the fees you can expect to pay for Slice, as well as the opinions of insurance experts about homeshare policies. I used my home address to get a quote from Slice to see how the system works. First, you’re asked to enter your address. Once you enter your address in the site, you’ll be taken to a page that has two main features: a map to confirm your address and a menu from which you can choose your property type: entire home, partial home, entire apartment/condo and a partial apartment or condo. We chose partial home. You also have the option of choosing “Other.” We chose “Other” and Airbnb and received the same quote for both: $7.25 per night. We also got that same quote when we said we wanted to rent out the entire house. What does that $7.25 cover? What does my policy offer that Airbnb wouldn’t? What Does Your Premium Cover? The coverage you get with a Slice policy is split up into two categories: claims that don’t require a deductible and claims that do. “Deductible” refers to a cash amount you have to pay out of pocket before your insurance kicks in. Say your renter trashes the granny flat they rented and it’s going to cost you $5,000 to repair it. If you’re deductible is $1,000, then you’ll have to pay that before Slice will pay for the covered repairs to the granny flat. This category of claims is pretty extensive and covers a variety of situations, including broken valuables, damage to electronics, bug infestation, the renter’s property, any citations as the results of your renter’s stay and even bug infestation and fungus/mold growth. What’s interesting about these coverages is that they cover the things that aren’t including in Airbnb’s Host Guarantee, which covers up to $1,000,000 in damages if your renter destroys your rental. That guarantee covers damage to your property but the list of exclusions is long and many of those exclusions are included in the Slice policy, leading us to believe that Slice and similar companies have created homeshare policies to fill the gaps left by Airbnb’s Host Guarantee and gaps in other companies’ insurance. Aside from coverage, the big difference between Slice and what Airbnb offers is that Airbnb’s host insurance is free. The fine print goes on to say that the water coverage does not cover the appliances or systems that leaked the water, water coming from leaks or overflows from non-business property or any mold or fungus directly caused by the water leak. Basically, if you’re renting out a granny flat in the backyard and that flat is ruined by a huge plumbing leak in your house, you won’t be covered, according to Slice’s exclusions. While the Slice homeshare policy is pretty extensive, there are certain things it doesn’t cover. The fine print also says the exclusions pertain to the damage listed here as caused by animals, humans or nature. So, while the water damage protection may seem like a nice perk, it’s actually very limited in what it covers. However, that makes sense. The policy exists to protect your property from renter negligence, not bad weather or negligence on behalf of the owner. » SEE ALSO: Does Home Insurance Cover Hurricane Damage? This is the type of exclusion list you can expect when it comes to other aspects of your policy. Basically, as we discovered, your personal property not related to the covered room or home and any damage not directly related to your renter wrecking your rental won’t be covered. This is a general guideline, though, so you’ll have to read through the various sections of your policy to confirm what’s covered and what isn’t. We made phone calls to multiple insurance carriers and were met with a lot of dead ends. For example, we talked with Allstate about their “HostAdvantage” homeshare policy program and were told that they didn’t offer it in my state. They did not say which states were eligible for it. Based on what we read on their website, homeshare insurance is available to homeowners with existing policies and not on an a-la-carte basis like Slice. We found the same to be true for Liberty Mutual; only those with homeowners’ policies are eligible for it. Price-wise, Allstate’s website says you can get this type of coverage for as little as $50 a year, but it’s really hard to say how they got to that number. We were not told about the factors that go into a quote but, based on our experience with insurance, that quote will probably have to do with the value of your home, the square footage of what’s being rented and how often you’ll rent it. 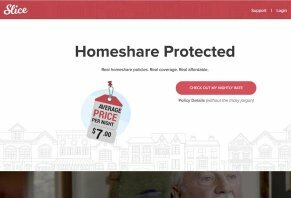 As for Progressive, they actually use Slice to offer homeshare insurance. In our opinion, the main reasons why big companies don’t offer homeshare to people who aren’t already customers is because it’s a new product and because these types of policies may be too risky for them. Homeshare insurance policies are an interesting game. Traditional insurance companies present their homeshare policies as an add-on to their homeowners’ insurance policies. The advantage of these policies is that they present some decent savings if you regularly rent out your room or home. For example, Allstate says their policies start at $50. Let’s say you rent out a room 100 nights out of the year through Airbnb. If you use my quote from Slice to calculate insurance costs, you’re looking at $725 in payments for one year. If you earn $50 a night, you’ll earn $5,000 but you’ll pay approximately 15% to Slice. An Allstate policy for $75, on the other hand, is about 1.5% of your $5,000 profit. Based on these numbers, we think that a traditional insurance company may be the cheaper option and, because of this, we’d say this is the main disadvantage of Slice. However, the advantages are pretty solid for those who either can’t get homeshare insurance in their state or only rent their room or house out a couple of times a year. You can choose to turn your policy on or off when you need to, which is a flexibility you just don’t have with traditional insurance providers. Another advantage? Our quote indicated that the per-night premium price of $7.25 is the same whether you’re renting out a room or an entire house. Our advice for you is to first check with your homeowner’s insurance provider to see if they can set you up with a quote for a homeshare price. Read over the details of the quote and the coverage, then compare it to what you get with Slice, who provides an in-depth explanation of your coverage when you sign-up your home. Figure out how many nights a year you’ll rent out your space. If the numbers are more advantageous with your insurance company than they are with Slice, it may benefit you to stick with your current insurer. Write a Review for Slice Insurance!